We finally finished painting the upstairs!!!!! It felt like this project took FOREVER to complete but it was all worth it. 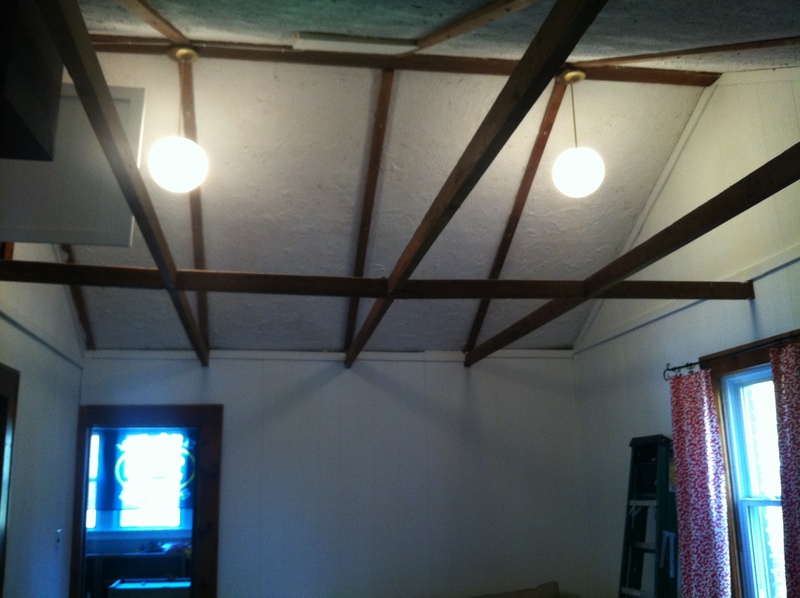 As you can see from the before photos a fresh coat of paint made a HUGE difference. 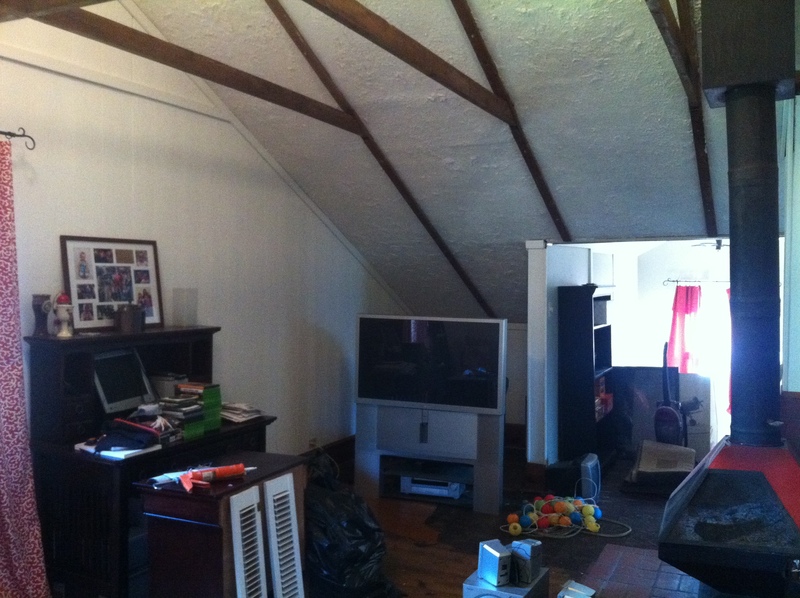 For one, it made the upstairs space look larger…not to mention the fact that it gave it a completely updated look. We used a leftover can of oil-based white paint for the trim on the staircase area. The paint originally cost about $45 but we used it for touching up trim through-out the rest of the house so…a little goes a long way! The previous owners installed the molding to disguise the drywall joints so, removing it seemed it would be too expensive of a task. 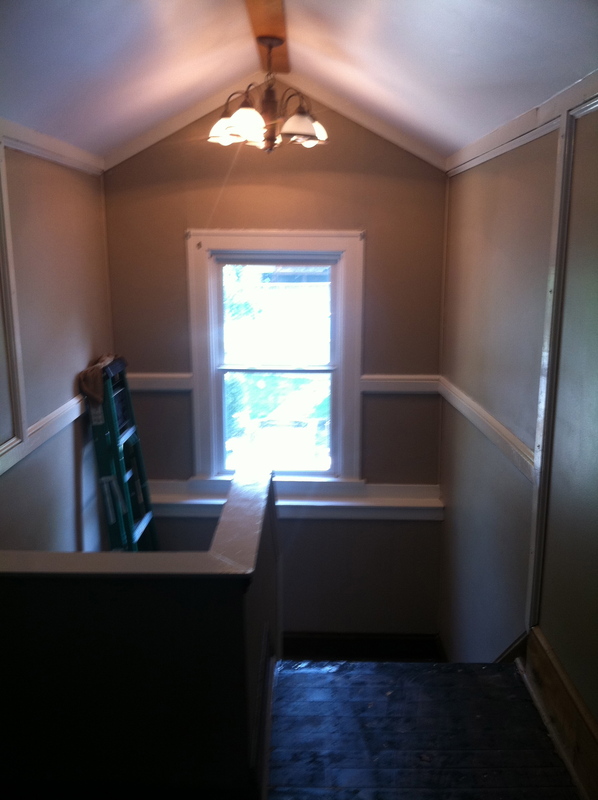 We also used an existing can of paint for the walls (paint color was from Sherwin Williams, name TBD). It only took one coat, despite the dark rust color that was on the walls before. We painted the faux-wood panelling using almost an entire 5-gallon jug of interior latex paint– it soaked up the paint very quickly and required two coats and then some touch-ups after the second coat. Here’s the other side of the upstairs living area…to the right of the TV is the staircase (just to give you a point of reference). Please, disregard the mess, we’re cleaning out our storage space upstairs as we go through these renovations so things are quite messy. Once the clutter is out and we bring in some new furniture and artwork, I think it’s going to be a major improvement from it’s original look. This is kind of the look we’re going for. I found this photo on the Country Living website but I’ve seen a lot of similar photos in the latest Pottery Barn catalogs as well as some great inspiration at West Elm.